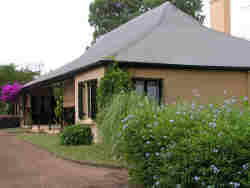 Commenced in 1793, Elizabeth Farm is Australia's oldest European building. With its deep shady verandahs, it became the prototype for the Australian homestead. It was built as the home of John and Elizabeth Macarthur and was the birthplace of the Australian wool industry. The interiors contain reproductions of furnishings and objects belonging to the Macarthurs, giving visitors an authentic glimpse of early l9th century life. Elizabeth Farm is situated in a gloriously recreated 1830s garden. There is a tearoom that serves Devonshire teas and lunch. The gardens at Elizabeth Farm reflects over 200 years of European tradition and includes some of the oldest exotic plants in Australia. Allow at least an hour to view the house and gardens. Catch the train to Parramatta station. The train trip, on the Western Lines (Yellow on the map) can take from between 20 to 30 minutes from Central Station with the time depending on whether it is a limited express or a stopping all stations. It takes about 15 minutes to walk to Elizabeth Farm from the Station. To get there turn right out of Parramatta Station and walk along Station Street then left into Parkes Street. Parkes Street becomes Hassell Street. Continue down Hassell Street and turn right at Alfred Street. The Farm is on the corner of Alfred and Alice Streets or, if you wish you can catch the bus1.